Today, we shed light on one significant AJAX-based improvement related to the default user experience of both Magento 2 and 1. 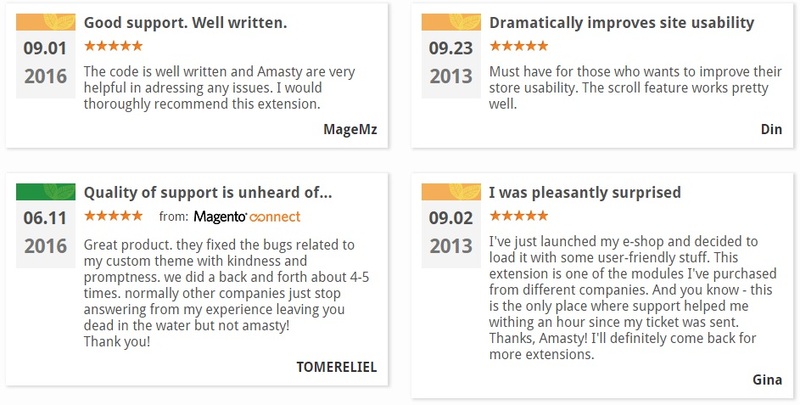 Meet the Magento 2 infinite scroll extension by Amasty – the ultimate tool that provides advanced navigation through your catalog, eliminating all reloads. High Performance. You don’t like to wait, right? The same is about your customers, so improved performance is always a good idea. You can significantly enhance it by replacing the default “next page” clicking with scrolling. Thus, everything will still be on the same page. Top Simplicity. 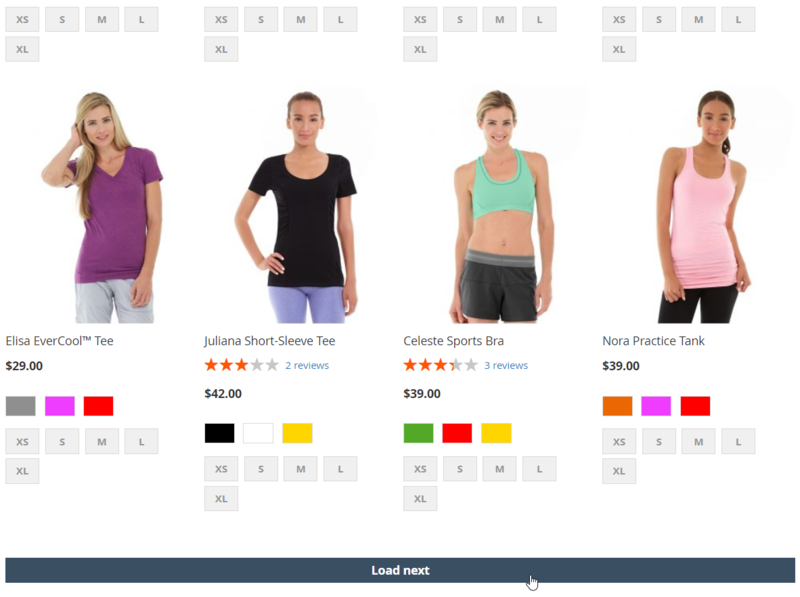 Another important aspect of the Amasty Infinite Scroll Magento 2 extension is the ability to view product details and return to the same place where you’ve stopped scrolling. So, there is no need to start catalog browsing over again. SEO Friendly Experience. Moreover, the extension is entirely SEO friendly. It not only provides search engines with the necessary data but also improves SEO by delivering a better customer experience. 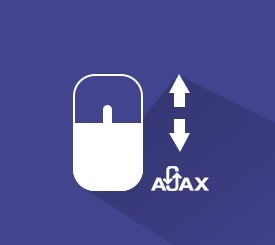 The AJAX plugin automatically reads next pages and loads them when a visitor reaches the page bottom. Customizable Buttons. The Infinite Scroll Magento 2 module provides the ability to change the location, shape, size, and color of corresponding navigation bars. You can customize the “Back to top” button, display page numbers on the info bar, as well as choose text labels for the loading buttons: “Load next”, “Load more”, and others. Loading Types. There are two loading types available with Amasty Infinite Scroll: autoloading which does not require any additional actions to be done and loading with the help of the “Load next” button. Link Sharing. Also, you don’t have to worry about damaged link sharing. 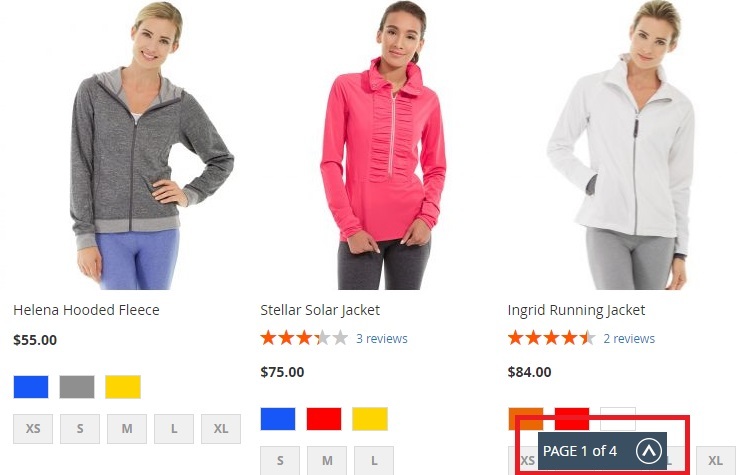 This vital feature works as it should: the AJAX plugin defines the location with high precision so that visitors can share accurate links to your catalog pages. Now, we’d like to draw your attention to the Magento 2 infinite scroll extension tutorial related to the backend experience of Infinite Scroll. To configure main settings of the extension, go to Stores -> Settings -> Configuration -> Amasty Extensions -> Infinite Scroll. Here you will see four sections of settings: General settings, Load Prev-Next Button, Info Bar, and DOM Selectors. First of all, choose a loading type. As mentioned above, you can set fully automated page loading (Automatic – on page scroll) or enable loading next pages via buttons (Button – on button click). At the same time, it is possible to disable the module by choosing None – module is disabled. Next, you can enable/disable current page numbers that are displayed above the loaded products in the product listing. The third field under this tab allows you to specify a path to loading image within your theme. As for the Load Prev-Next Button section of the Magento 2 infinite scroll extension, its settings are optional. If necessary, you can specify the text that will be displayed on both action buttons (Prev and Next), as well as CSS rules for them. The Info Bar section is optional as well. It allows you to enable/disable info bar with current page number and total pages count, as well as set CSS rules for the bar. The DOM Selectors section of the Magento 2 infinite scroll extension is designed for custom themes. It allows you to specify products groups. We’ve just discovered that the backend section of the Amasty Infinite Scroll Magento 2 extension is quite intuitive, but what about the frontend appearance? The Info bar shows your current page and the total number of pages. Besides, you can click the arrow to return to the top. It is also necessary to mention that although no reloads occur, the URL changes every time you scroll to the next page using the Magento 2 infinite scroll extension by Amasty. Now while scrolling down the Load More button appears without loading icon. After clicking on the button, it is possible to show or hide the loading icon. As you can see, the Amasty Infinite Scroll Magento 2 extension revamps the default navigation, substantially improving the user experience. If you want to provide customers with catalog better browsing opportunities, don’t hesitate to purchase the module. The Magento 2 infinite scroll extension costs only $99, while its predecessor is even cheaper – just $59.